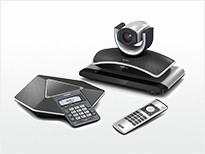 The VC120 is Yealink’s latest innovative 1080P full-HD video conferencing endpoint for branch offices. It is designed to provide ease-of-use, high-quality and cost-efficiency.To make life easier still, the VC120 supports an intelligent firewall transversal which allows users to plug and play with no further firewall configuration from box to work in just five-minutes. In addition, VC120 also supports bandwidth dynamic adaptive adjustment, and an 8% resistance packet loss. It is definitely the best choice for business video conferencing.